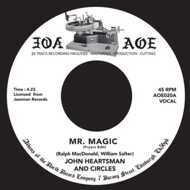 Jazzman Records released the Holy Grail LP of John Heartsman. I did my own edit of 'Mr. Magic' whilst mastering the LP and spun it since then on Dub but never thought to put it out. It fixes the D.J Kryptonite fade-in so it's straight in on the action and much more dj friendly, not rocket science but it works. Bang it on with 'Talking About My Baby' on the flip and you have a brilliant 45.